Thanks to Ruth Fitzsimons for the lovely review of Holly Webb's " The Snow Bear ". 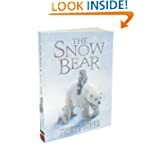 This Book is about Sara and her Snow Bear, and their adventures in the Artic. Sarah and her Grandad build an igloo and a Snow Bear and that night she falls asleep in the igloo. The next day Sara and the Bear set off on an exciting journey to find Snow Bear's Mam. I really enjoyed this book and it was very hard to put it down. I also learned a lot about the Inuit families. I think it would be suitable for children aged 7-9 years and I would recommend it to my friends.